Captures the details of the board of directors. Captures stakeholders of the enterprise. Captures any external business unit that is not under direct control of the enterprise, but has a relationship with the enterprise. Captures any business unit that is under direct control of the enterprise. Captures the details of personnel in an enterprise. Captures the contract-based relationships between business units. 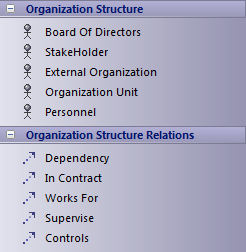 Captures the details of team links; for example, Stakeholder 1 works for Organization Unit 1. Captures Unit in charge or Person in charge information.